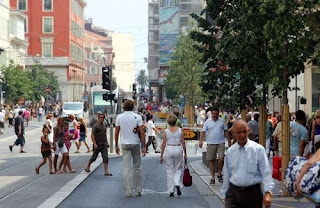 I've mentioned avenue Jean Médecin quite often because it's one of the most popular avenues in Nice and it is where you can find anything you might need. The street is named after former Nice Mayor Jean Médecin and his son Jacques, who together held the position of mayor for a combined 57 years. As it is a commercial hub with several amenities as well as luxury shopping, it's definitely one of the major arteries in the city. Here you will find the architecture is a mixture of traditional and modern. I love walking down avenue Jean Médecin at any time of the day or night, but especially in the morning when the city is just waking up. Watching the locals head to work and shops opening give the perfect start to my day. 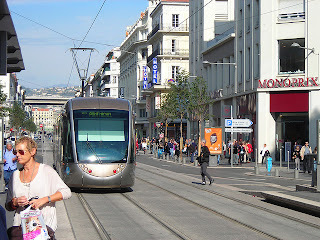 I usually don't even bother to take the tram that goes down the avenue as part of the main route as I prefer a leisurely stroll to get me to where I want to go. 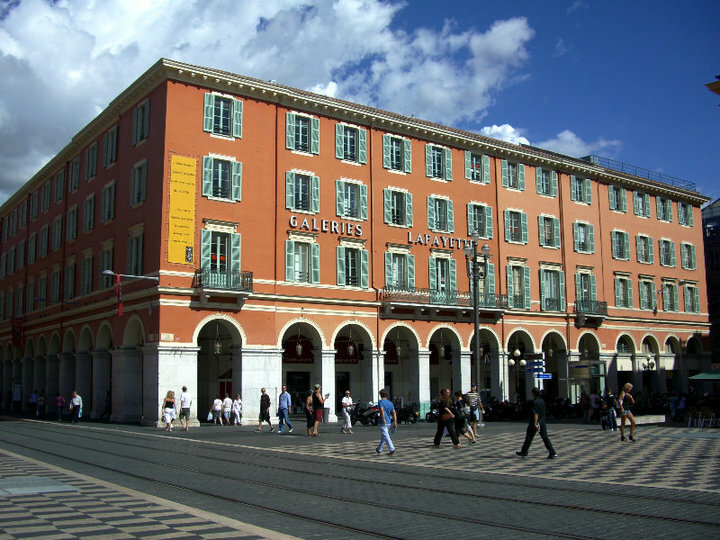 At the South end of avenue Jean Médecin, closest to the beach and right at Place Massena is the national department store Galeries Lafayette, located at: 6 avenue Jean Médecin. Close by is a very large Sephora at: 8 avenue Jean Médecin, and next door is the equally sizeable Zara boutique at: 10 avenue Jean Médecin, where you will always find very hot, yet professional, retail clerks working. There are numerous other retailers in the immediate vicinity. Crossing the street will put you at Virgin Megastore, located at: 15 avenue Jean Médecin. Update: Unfortunately it was announced in late 2012 that all the Virgin Megastores will be closing for business across France. Back across the street and a few blocks down you will come across Nice Etoile shopping mall, located at: 30 avenue Jean Médecin. Etoile is so large that it takes up its own block of services and specialty shops covering a number of floors. I will explore this mall in greater detail in a later blog post. 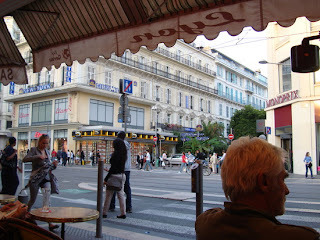 Keep in mind that avenue Jean Médecin is the place to go too if there is something you forgot to pack for your trip. One block over and you will find Monoprix, located at: 42 avenue Jean Médecin. This is a big grocery and department store. Any food, clothing or drugstore item you may need can be found there. Did I mention that the store also has a fully stocked liquor area with a number of great wines? Next door you will find Fnac at: 46 avenue Jean Médecin. 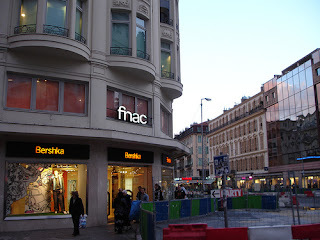 Fnac is a national chain that sells everything from books, concert tickets, audio and visual equipment to CD's and DVD's. Fnac is quite a large store that covers at least 5 floors, I love how the interior and exterior architectural details have been kept and maintained. 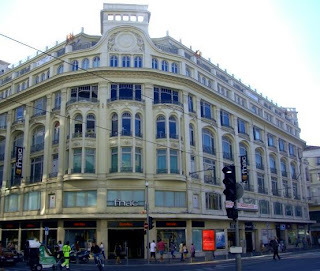 In the same building as Fnac, on the corner is the ever trendy Bershka shop and literally across the same side of Avenue Jean Médecin is the popular Pull & Bear. Both are great places to shop if you wanted to find something quick and casual for everyday use or a night out! If you need to do some banking, there are also several major bank branches along the way. You'll find a little bit of everything on avenue Jean Médecin, discount 2 Euro shops (that's "dollar store" to North Americans), sports stores, tourist shops, a wide variety of hotels plus wonderful cafes to relax and people watch. 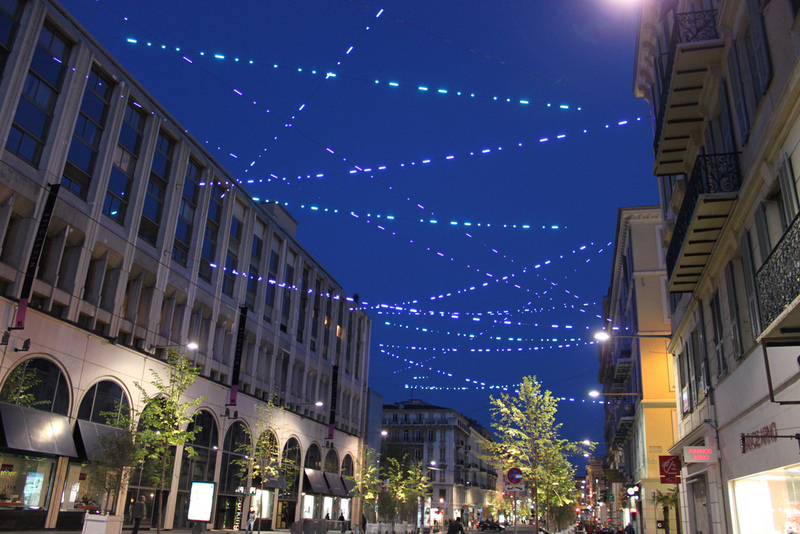 From one end to the other, avenue Jean Médecin is a great place to explore, find what you need and use as a guide as a first timer to the city in order to find your way around. It's a main corridor that I have always found safe and friendly to use.